Erich Reusch Acht-Bild, 2012 - 2015 Acrylic on canvas 100 x 100 cm 39 3/8 x 39 3/8 in. Erich Reusch’s second solo exhibition at Aurel Scheibler opens on September 16. 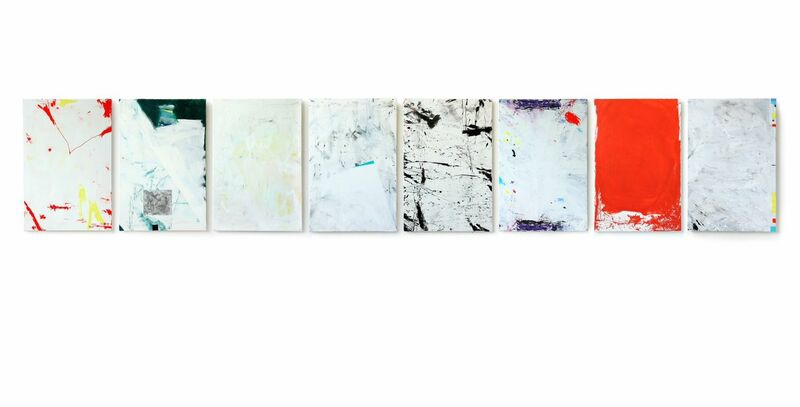 OHNE TITEL concentrates on recent paintings. The Acht Bild (2012 – 2015), Reusch’s largest multipart work on canvas to date, is the focus of the exhibition. It is complemented by new electrostatic objects and a photographic work of 1971. The exhibition is on view until November 14. Reusch’s method of transgressing boundaries and treating perception as agile and active, has recently expressed itself in the medium of painting. Here his gestural, expressive dashes, geometric shapes and trajectories move beyond the borders of the painted surface and still seem to locate the viewer. The constant fluctuation of geometry and movement, and the placement of triangle, square and circle within the gesture disquiet and challenge the flexibility of perception.